This Christmas, why give your loved ones presents they’ll just forget in a week? Why give your wife a diamond ring she’ll just end up throwing in the gutter? Why give your children toys they’ll just trade for drugs? No, make this Christmas one to remember by giving the important people in your life bugs — specifically those holiday time favorites, honeypot ants, those magical insects so gorged with food that their abdomens swell, rendering them crawling Tupperware containers filled to the brim with sweet, sweet candy. Ah, yes — picture the looks on your family members’ faces as they partake in a tradition beloved by the Australian Aboriginal people: biting into the unnaturally enlarged midsection of these unfortunate creatures (which are used by other members of their species essentially as dessert carts) and savoring the sugary goo that flows out. Honeypot ants make for a memorable addition to any holiday gathering. Your children will say, “Christmas was never as good as when you fed us bugs.” Chocolate fudge what? Gingerbread men who? 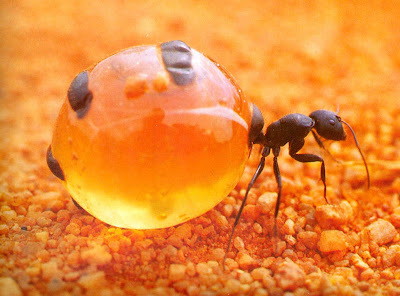 In the Australian outback, these ants would normally spend their days regurgitating their delectable stores for other members of their colony, but think of how much those in your human colony will appreciate stealing this precious, life-giving fluid and eating it as treats, when they’re already full of so much other food. Remember: This Christmas, make your family eat bugs.